TOPICS below "A. Events affecting the LAW OF SEA from 1945 - 1973"
6. The Sea-Bed - "Common Heritage of Mankind"
The most frequent and serious conflicts within the scope of the law of the sea used to arise from the clash of two opposing fundamental principles, territorial sovereignty and freedom of the seas, or, to put it more concisely, the interests of the states protecting their merchant, fishing, and naval fleets. On the one hand, coastal states had territorial sovereignty in their territorial seas, but the extent of this sovereignty and the enforcement of law over vessels using the territorial sea was often disputed. On the other hand, the principles of freedom of navigation and fishing were important for states under whose flags vessels sailed. Until the middle of this century, fishing and navigation were the only important economic uses of the sea, and conflicts were on the whole limited to questions in these matters; they were therefore more a legal matter involving particular incidents than one of wide-spread concern. International shipping was essential for coastal states as well as flag states, and countries were frequently active in both roles. This is surely one reason that the law of the sea, relying on three hundred year old principles, was in 1945 still an "unwritten" law and had not yet been codified; it applied as customary international law. Such law can be described as international custom, as evidence of a general and consistent practice by states which is generally accepted (whether duties or rights) as law. Codification attempts for the freedom of navigation, fisheries, submarine cables and pipelines, and airspace over the high seas in the period following the First World War did not succeed. At that time, an occupation of the sea-bed was considered beyond the capabilities of any state. General opinion tended towards the view that the legal status of the sea-bed should be governed by the same principles as the waters above it. But such a regulation was never codified and, with the exception of the laying of cables and pipelines, the sea-bed remained out of reach for any use. As advances in technology increased the range for long-distance fishing vessels, fishing just outside the territorial waters of other states, but still within a few miles of the coast, began to increase, at first a cause of concern to coastal states. Beginning in 1945, some states began implementing measures to protect the living resources of the sea for their nationals beyond the limits of the territorial sea, then generally accepted as being three nautical miles in breadth. The principle of unlimited freedom of navigation was seriously called into question during the 1960s, when disastrous tanker accidents dramatically showed the effects of pollution on the marine environment, and coastal states began to demand more rights to protect their coasts and coastal waters. The narrowness of the law of the sea was also painfully illuminated by the growing use of the sea-bed. Shortly before World War II, when no one even knew of resources in the deep sea-bed, much less had the means or technology to explore or exploit them, off-shore drilling for oil and gas in waters near the coast and in shallow water had begun. With the immense growth in technology which accompanied the rapid expansion of these activities, exploration became possible in ever deeper waters. The question as to whether exploitation of resources from the seas beyond national jurisdiction should be subject to the principle of freedom of the high seas had forced its way into immediate relevance, and a generally accepted answer was needed. Finally, the conflict between these opposing rights and interests was complicated by increasing awareness of questions of equality and equal use of, access to, and participation in the riches of the sea, as many countries did not have the means, know-how, or trained manpower which would enable them to compete on equal footing with the traditional industrialized states, whether in navigation, fishing, or mining. If these nations were to enjoy the right to participate in the resources of the sea and shoulder the responsibility of dealing with problems such as pollution, they had to be protected from the crush of overwhelming competition by being granted sole rights over resources and being given the opportunity to act together with the more advanced countries. Sources of conflict on the seas, formerly restricted mainly to fishing and navigation on territorial seas, have thus increased in number and scope since the end of World War II. The government regards the natural resources of the subsoil and sea-bed of the continental shelf beneath the high seas but contiguous to the coast... (to be) subject to its jurisdiction and control. These proclamations had far-reaching effects on fishing and exploration of the sea-bed. At the time, the continental shelf claim was not very controversial; the proclamation on the conservation of fisheries, by contrast, was. Other states such as Great Britain opposed any challenge to the traditional principles of the law of the sea, in particular the freedom of fishing and freedom of navigation. Time would show that this was precisely the significance the Truman Proclamations would have for the law of the sea; certain recent developments in this regime can be traced back to President Truman's actions. In the wake of the Truman Proclamations of 1945, a number of states took measures for the protection of offshore resources. Mexico followed the Truman lead by issuing similar proclamations, and Argentina in 1946 and Chile in 1947 extended their sovereignty considerably beyond the territorial sea. Chile acted in particular to protect its whaling industry from the competition of foreign fleets. Within a few years, several South American states had claimed extensive rights, some demanding full sovereignty over coastal water zones extending up to two hundred nautical miles. These claims were generally rejected. The South American states were followed in moderate measure by some of the states bordering the Arabian Gulf, who declared the sea-bed adjacent to their territorial sea to be subject to their jurisdiction and control, a step necessary at that time to clarify the status of and control over drilling platforms in the Arabian Gulf . This trend was to continue. By 1958, about twenty states had made similar sea-bed claims. At that time, the right of the coastal states to make such claims on the continental shelf was not in question; instead, the disputes revolved around the definition of continental shelf and the resulting delimitation of the zone. These disputes must be regarded against the background of the legal point that possession or occupation is to some extent related to the ability to control or use the area, and technology had not yet advanced far enough to allow work in deeper waters. The basic "right" of a coastal state to the (exploitable) resources of the sea-bed off its coast was regarded as "natural." Freedom of fishing was not seriously threatened, although there were certainly local conflicts resulting from states' desires to protect the short-distance fishing industries of their nationals. A certain regulatory effect resulted from the establishment of international regional fishery commissions empowered to take nec�essary measures for conservation. However, the wide-spread belief that the living resources of the ocean were inexhaustible had not been proven false. The work of the United Nations Organization, founded in 1945, was to have a different effect on relations involving the sea. A maritime body, the International Maritime Consultive Organisation (now the International Maritime Organisation, IMO), was established. The purpose of the organisation was to provide machinery for governmental regulations and practice concerning maritime safety regulations and efficiency of navigation. 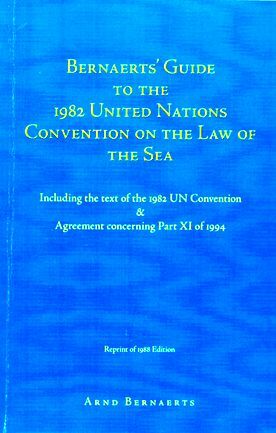 Even more directly related to the codification of the law of the sea was the work of the International Law Commission of the United Nations. In 1949, the Commission decided to give its work on the law of the high seas top priority. The Commission was advised by the UN General Assembly on December 6, 1949, to include the regime of the territorial sea in its work. The Commission's report resulted in the convening of a conference in 1958. On February 21, 1957, the UN General Assembly resolved that not only the legal but also the technical, biological, economic, and political aspects of the problems should be the subject of the conference's deliberations. At the 1958 conference, the eighty-six states in attendance adopted four conventions: the "Territorial Sea and the Contiguous Zone," the "High Seas," the "Continental Shelf", and "Fishing and Conservation of the Living Resources of the High Seas." These four conventions entered into force between 1962 and 1966. Progress had been made by codifying to a large extent customary-law, but agreement on substantive questions had not been reached. The second conference in 1960, convened to consider particular questions regarding territorial sea and fishing matters which had not been resolved in 1958, failed to adopt a convention. Developing countries wanted, mainly for surveillance and security reasons, a considerable extension of the territorial sea, then still generally recognized as being three nautical miles. The large shipping nations and naval powers, on the other hand, were deeply concerned about the effects any changes might have on the principle of freedom of navigation. It was requested that the limits of the territorial sea be set at twelve nautical miles. As far as the continental shelf was concerned, the regulations of the convention were not acceptable to the many states which had only a narrow continental shelf, as the convention defined the continental shelf as the sea-bed from the outer limits of the territorial sea to the 200-meter isobath and beyond this limit where the depth admitted exploration of natural resources. In addition, the problem of fishing rights beyond the territorial sea had not been solved for many coastal states. The negotiations of the 1960 Conference ended inconclusively. Three of the 1958 conventions were ratified by about fifty states, thus gaming a certain measure of acceptance. The Convention on Fishing and Conservation of Living Resources of the High Seas, however, was ratified by only thirty-five states. This was due to the fact that conservation principles provided by the convention were already being practiced by fishing commissions which had been established in various regions, and the convention did not deal with the short-distance fishing interests of the coastal states. As the United Nations Conferences I and II on the Law of the Sea in 1958 and 1960 failed to adopt substantive proposals on the breadth of the territorial sea and coastal state fishing rights in coastal waters not covered by the continental shelf regime of 1958, the widely diverging territorial sea claims of various states seriously challenged the unity of the law of the sea. Claims of territorial seas with a breadth of twelve nautical miles or more tripled from about twenty to sixty during the decade following the conferences. Although every extension of a state's territorial sea necessarily means the extension of its exclusive fishing rights, even this quadruple expansion was seemingly insufficient. Many coastal states proclaimed a so-called exclusive fishing zone of varying breadth, although in most cases it did not exceed twelve nautical miles. More than thirty such claims had been made by the end of the 1960s. It was at this time, moreover, that the exhaustibility of the living resources of the sea became obvious. From 1955 to 1965, the world fish catch almost doubled and reached levels of overexploitation which seriously endangered the survival of the resources. Conservation measures, management, scientific research, and catch quotas on a large scale became essential. A further matter of growing concern was that the major fishing nations (about twenty states) harvested four times as much as the rest of the world together. Extensive fishing to the point of overexploitation was undoubtedly a factor leading to an increase in the number of local controversies over fishing rights, such as the escalation of the "cod war" between Iceland and European countries to a high level of tension. Nevertheless, or perhaps because of such conflicts, many regional fisheries agreements were negotiated and concluded. A combination of forces led to the call for a third conference on the law of the sea, in the hope that satisfactory solutions to the growing problems and legal uncertainties in maritime law could be found. Under no circumstances, we believe, must we ever allow the prospects of rich harvest and mineral wealth to create a new form of colonial competition among the maritime nations. We must be careful to avoid a race to grab and to hold the lands under the high seas. We must ensure that the deep sea and the ocean bottoms are, and remain, the legacy of all human beings. The UN General Assembly began to act only on the initiative of the Ambassador of Malta to the United Nations, Arvid Pardo, who in 1967 recommended to the United Nations that the resources, other than fisheries, of the high seas beyond the territorial sea and the sea-bed beyond the continental shelf be proclaimed as belonging to the United Nations Organisation and as being subject to its jurisdiction and control, as otherwise militarization of the sea-bed and exploitation of its resources by highly developed countries to their national advantage and to the disadvantage of poor countries was probable. In addition to the important content of his suggestion, Pardo's efforts were of significance because they stirred the UN General Assembly to action. Within only a few weeks, the Assembly had established a Sea-Bed Committee to study this problem. On December 17, 1970, the Assembly declared the sea-bed and ocean floor and the subsoil thereof, beyond the limits of national jurisdiction, as well as the resources to be the common heritage of mankind. A new concept had been established. As for the origin of the term itself, US President Truman is said to have presented a plan at the Potsdam Conference in 1945 according to which all large rivers would be governed by a regime of common heritage. The term "common heritage of mankind" is of immense political value, but at the same time it can hardly be called a legal term at present and, if used might well cause confusion rather than clarify a situation. Nonetheless, the expression could prove to have a major impact for the law of the sea and beyond in the future, and it will in any case be of value as a guideline for interpretation of the deep-sea mining provisions. In December 1967, the General Assembly of the United Nations established the Committee to Study the Peaceful Uses of the Sea-Bed and the Ocean Floor Beyond the Limits of National Jurisdiction; at the time it was established, the Committee consisted of thirty-five members, but was later enlarged to more than ninety. The Committee was instructed to study all aspects of international law concerning the deep sea, including provision of machinery for the exploitation of the resources in the interests of mankind, and other UN institutions were charged to support the Committee in its work by providing information on studies for the prevention of marine pollution, exploitation of resources, the needs of developing and land-locked countries, and long-term scientific considerations, including exchange of data and research capabilities. On the basis of the Committee's proposals, the General Assembly in 1970 solemnly declared as the first of the principles governing the sea-bed area the concept of the "common heritage of mankind." The Assembly further decided that this and other principles included in the declaration should be embodied in an international treaty of universal character and that such a treaty should be drafted by a Third United Nations Conference on the Law of the Sea to be convened in 1973. The Sea-Bed Committee was instructed to make preparations for the Conference and draft treaty articles embodying the international regime of the deep sea area. The Committee prepared a list of subjects and issues to be dealt with by the Conference, but failed to produce the text of a single preparatory document for the Conference. Although several members or groups of members had submitted various proposals to the Committee, a concensus could not be reached on basic texts.